The Blue Heron offers a striking setting inside Sunderland’s 148-year-old former Town Hall. The menu at the Blue Heron Restaurant & Catering lists more than 25 farms in Western Mass. that supply the Sunderland restaurant with fresh meat, produce, and dairy products. Co-owner Deborah Snow says that’s just an extension of what she learned as a child growing up on a farm in Ohio. As a child, Snow fantasized about owning a restaurant, but chose instead to study art history and photography in college, aiming for a career in art and, in the early ’80s, landing a photography exhibition for the United Nations. Still, she found that the food world was no hindrance to her goal of being an artist — it simply represented a different kind of art. After running a small restaurant in Boston, she moved to Western Mass. and worked as the prepared food manager at Bread and Circus, then took catering jobs with Amherst College and Northfield Mount Hermon School, where she met her eventual partner in business and in life, Barbara White. White took a similarly circuitous route into food service. She began her career as an elementary-school teacher, worked in an alternative school in the 1970s for a few years, moved to Massachusetts, and ran community-based mental-health programs for teenagers. 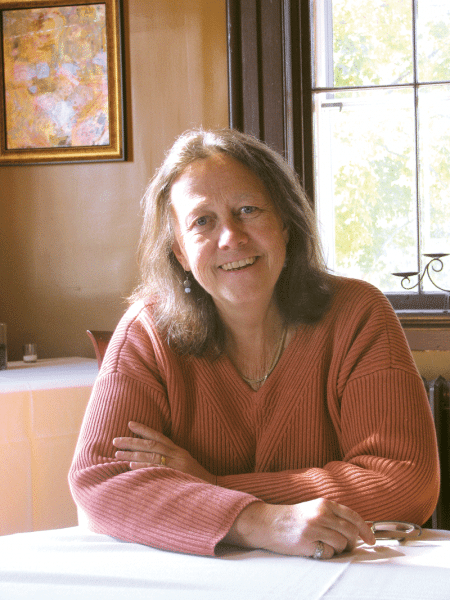 At Northfield Mount Hermon School, where she worked first as a campus dean and later as director of parent programs, she decided to launch a catering business with Snow, which led to the Blue Heron. 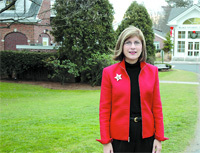 “She was an educator and administrator, but she always had this desire to be in the hospitality business, so that’s what we did,” Snow said, adding that the restaurant initially opened on the banks of the Sawmill River in Montague in 1997 and quickly caught on with the dining public. 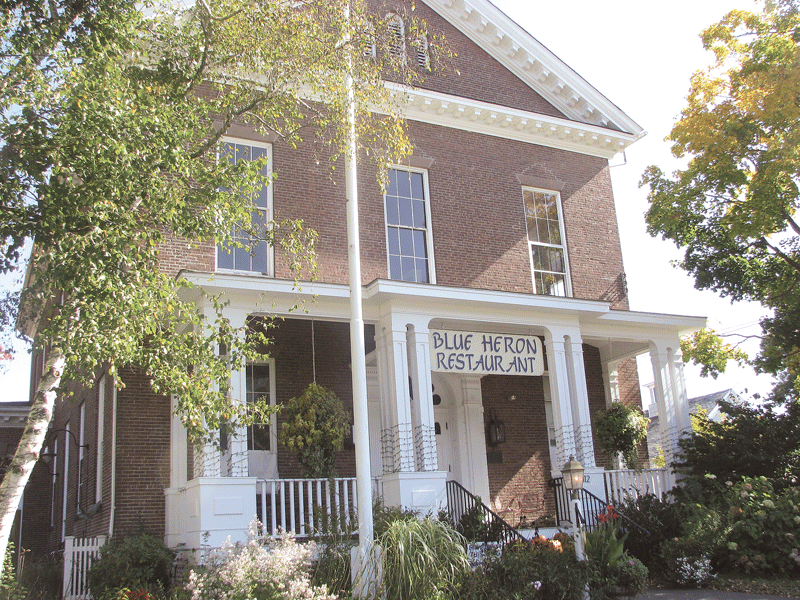 Deborah Snow says the Blue Heron was focused on locally sourced food long before it became an industry buzzword. With the customer base growing, Snow and White went looking for a new, larger location, and found an ideal spot in the Old Town Hall in Sunderland, which had fallen into disuse for almost a decade. 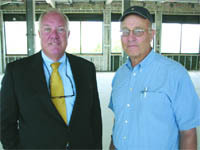 After purchasing the property from the city for $1 and undertaking an extensive remodeling job, the Blue Heron reopened in 2004. Built in 1867 to house the Sunderland town offices and grammar school, the building has served myriad municipal functions over the years. The first floor and basement were remodeled in the 1940s, but the second floor retains its original construction, including the Great Room’s pressed-tin walls and ceilings. Now, the partners are hoping to create new memories for diners through fresh, eclectic food in a striking, historic setting. When the Blue Heron first opened, however, exotic ingredients were harder to find than they are in 2015, when even the most Americanized grocery stores carry a wide range of Asian, Indian, and Middle Eastern sauces and spices. However, while the ‘globally inspired’ aspect of their philosophy has evolved with the greater choices available today, the ‘locally sourced’ aspect was strong from the start. It also provides incentive to change the menu seasonally; rather than tomatoes and corn and berry-centric desserts, the fall and winter will see increased usage of potatoes, carrots, parsnips, turnips, and kale. While she no longer cooks on a nightly basis, Snow remains active in designing the menu, and she relishes the challenge of party bookers who request traditional ethnic dishes, from Indian to Mexican to Chinese. That kind of response, Snow said, is gratifying, and begins with a philosophy that fresh, local food beats freezers and powders — and it has helped her and White carve out one of Franklin County’s tastiest success stories.